You can read or download the abstracts of the papers to be presented at the conference here. The conference is open to the public and there is no registration fee. The organizers are unfortunately unable to aid in the travel arrangements or accommodation of participants. If you wish to attend, please send an e-mail to foundlaw@gmail.com by September 14th, 2016. University main building, Small hall (4050). Fabianinkatu 33, 00170 Helsinki. House of Science and Letters, room 505. Kirkkokatu 6, 00170 Helsinki. Jaakko Husa (University of Lapland): Rule of Law – an Empty Conceptual Vessel? The sessions of the conference are held at the University main building (Small hall (4050), Fabianinkatu 33, 00170 Helsinki) and the House of Science and Letters (room 505, Kirkkokatu 6, 00170 Helsinki). * You can get from Helsinki-Vantaa airport to Helsinki City Centre either by taxi (the fare is approximately 40-50 euros), by train, or by bus. * You can find the timetable of the airport train here. * The buses take you to the Central Railway station. You can either take the city bus number 615, which costs 5,50 € (cash (the driver doesn’t have to accept bills larger than 20 euros) or Travel Card only), or the Finnair bus, which costs 6,30 € (cash (bills larger than 20 euros not necessarily accepted), credit cards). * The metro station nearest to the event location is called Helsingin yliopisto. 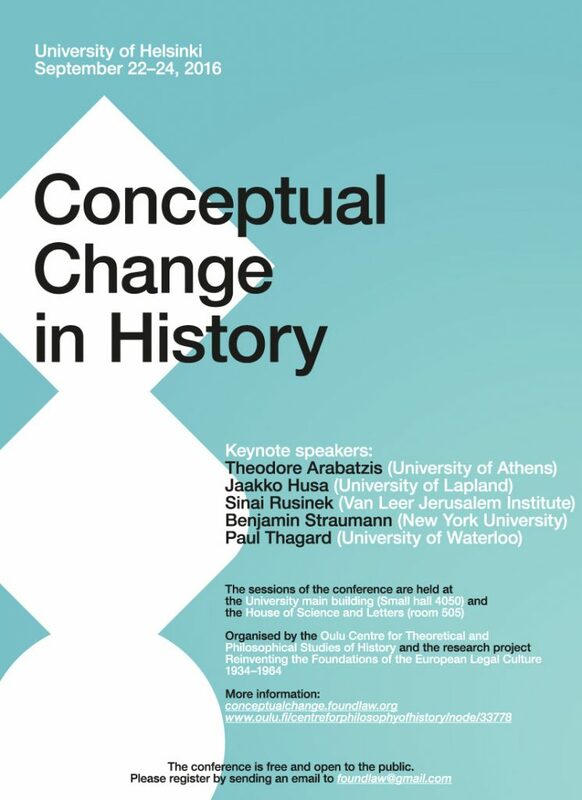 Organised by the Oulu Centre for Theoretical and Philosophical Studies of History and the research project “Reinventing the foundations of the European Legal Culture 1934-1964”. The three-day conference hosts presentations by keynote speakers and additionally invites submission for plenary papers. Please email submissions to Heta Björklund (foundlaw@gmail.com) by March 31, 2016. The maximum length of abstracts is 300 words.